Last Friday the little child in me was utterly disappointed. [*SPOILER ALERT*] I really thought the audience would see the giant insect on stage… as it turns out, the actor just had regular clothes on and we were meant to use our imagination and pretend he is a giant insect. 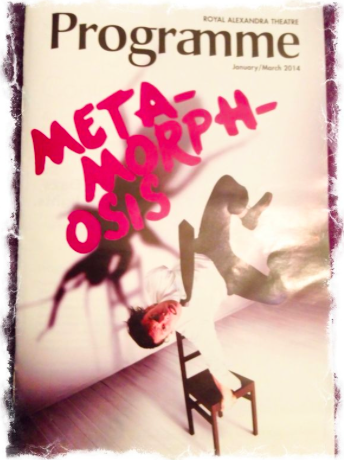 My guess is that Kafka knew Metamorphosis was his masterpiece. It was his gift. 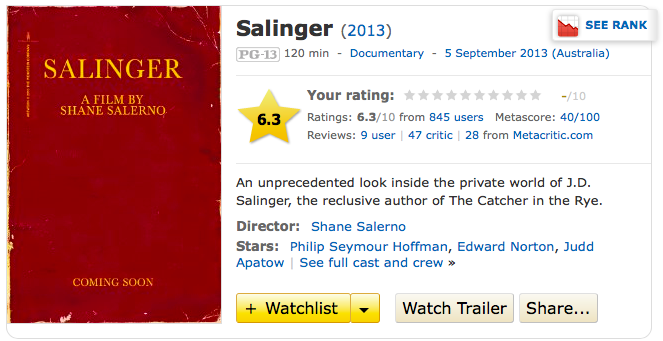 It made me think about Salinger and The Catcher in the Rye. I think it is the top selling book never to be turned into a movie. The author passed away but he made it very clear in his will that his novel can NEVER be made into a movie. I am not sure if the documentary covers the author’s reluctance to sell the rights to his masterpiece to movie makers, but the answer is in the book itself: Holden Caulfield feels his brother was a sell-out for going to work in Hollywood. He hates the movies. Even if Holden is just a character and does not reflect the author’s view of the world… Salinger still has a responsibility to his creation. A responsibility to his gift. The play last Friday did not have an intermission, but you can say I took a break in my head. Sitting at the theatre watching Metamorphosis and thinking about Salinger, I made a connection to another artist that never made appearances or gave interviews: Bill Watterson. 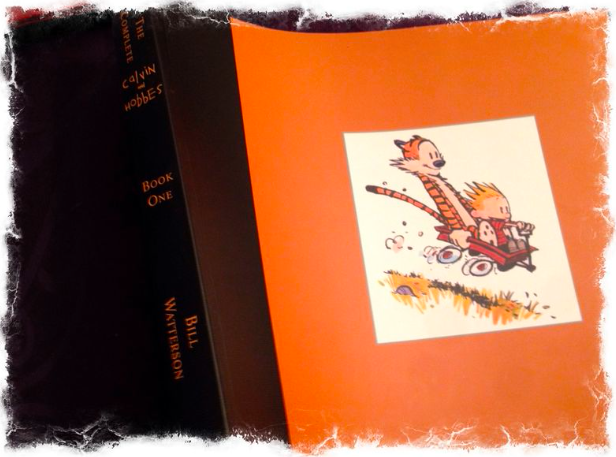 Bill Watterson created the comic strip Calvin and Hobbes. People familiar with the work know that Watterson never allowed merchandising of his creation on the grounds that it would cheapen his art. An exorbitant amount of money was offered but he did not budge. At some point animation studios approached Watterson to turn his strip into a series. One of the things that presented a big obstacle for an agreement to me reached: the idea of hearing Calvin’s voice was a scary proposition for the author. It was never about money. There was a connection between the author and the creation. A deep sense of gratitude and responsibility. After the play last Friday I went with my wife to Shoeles Joe’s to get a drink and a burger. We talked about Kafka. The book came out almost one hundred years ago… and while we are never given an explanation as to what happened to Gregor Samsa, we agreed that in the eyes of his family his value was matched by his economic contribution to the household. The moment he was unable to work, he became a bug in the eyes of his family. We can look at this with insight from the Golden Circle. We learn that Gregor was working hard to send his sister Greta to the conservatory to study violin… but we never get much insight on what he wants. What are his dreams? When his father’s business fails, Gregor takes on a job he hates. The thing that threw me off when I first read the book is the fact Gregor never tries to find out why or how he woke up one day as a giant bug. He simply accepts it… much in the same way he accepts his fate at the end of the book. You have to ask why. One hundred years have passed and this is true now more than it ever was. We live in the digital age where challenging the status quo is crucial for those who want to develop their personal brand. Why did Salinger and Watterson behaved the way they did towards their work? I think finding the answer can help us get better at looking at our own work. Here is a link to the image below. It talks about writing books, but I think it applies to life itself. « Wow… where do all pillows go?